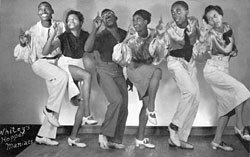 Are you new to the world of Lindy Hop? Welcome, we look forward to dancing with you! To try out Lindy Hop, you can join a taster lesson at one of our dance events (usually Saturday Swing SOS and Sunday tea dances) – check the calendar and announcements here on the website. If you want to learn more, join our classes! The beginner level is Lindy A. No dancing experience needed – the class is suitable for absolute beginners. Don’t you worry about your two left feet! We will focus on getting you out on the dance floor and having fun as quickly as possible. Click here for practical information on schedule, location, prices. The registration form is here. Questions? Check the FAQ or send us an e-mail!